While I lamented the bare – and barely frozen – ground following the last in a series of winter rainstorms, my kids seemed happily oblivious to the utterly, depressingly un-snowiness of the landscape. They are winter-loving, snow fort-building, ski-fanatical kids. But rather than dwell on the lack of snow, they seem to intrinsically embrace the extended daylight that creeps into mid-February days and the subsequent opportunity for longer outside play. Perhaps kids are simply better at going with the flow, rolling with the punches, living in the moment, looking on the bright side – pick your idiom. On the afternoon after a steady rain had washed every trace of winter from our yard, while I stewed over this no-snow season, the kids eagerly ran outside after school. They bypassed the pile of long neglected snowshoes on the front porch and the sleds leaning forlornly against the house, climbed past the plow left idle many weeks, and pulled their bikes from the depths of the garage. 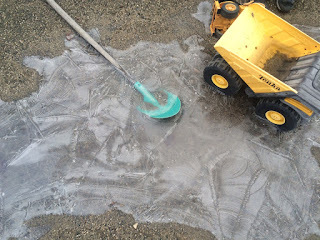 Up our long driveway of frozen gravel and slim rivulets of ice they rode, visiting some of their favorite warmer-weather haunts in the yard, places that are normally buried in snow by the middle of February. A few days later, we were all back on snow – the manmade kind – to ski. And we’ll ski every day we can for as long as that manmade stuff sticks to the trails. Where last winter seemed like a mini Ice Age of sustained subzero temperatures, allowing us to become acclimated to the constant cold, this winter has been an ongoing test of our ability to go with the ever-changing flow of the weather and its consequences. We have skied on a rainy day when the wind blew so hard the raindrops came sideways: tiny, semi-frozen pellets pelting us mercilessly. We have skied in warm rain and on the days after, when the temperature drops and the skiing surface hardens to something resembling choppy pond ice. We have skied, very occasionally, in fresh snow. A couple weeks ago we braved wind chills of 40 degrees below zero to ski the nicest conditions we’ve had all year. The snow that day was soft, super-grippy, and utterly carve-able. The sun was out, and there were friends to ski with. My kids didn’t balk at the thought of skiing on such a frigid day. They just went with the normal Sunday morning flow: breakfast, ski boots, chairlift. Two days later it was 40 degrees above zero and raining. Again. The day after that storm I returned home from coaching aspiring ski racers, frustrated by the unwintryness of this season and weary after a few hours of coaxing small children down trails coated in impenetrable ice. I longed for tall snowbanks and frosted trees, the soft crispness of winter white, the magnificent quiet of new snow. Instead I found the green tips of daffodils sprouting from the flower bed next to the house and muddy puddles that have been through so many freeze-thaw-freeze cycles in the past few weeks that I’ve lost track. This winter has seemed like one long April, when Ma Nature keeps us guessing as she switches the seasons in a one-step-forward-two-steps-back sort of manner. Weather is notoriously unpredictable in any season, of course, although we keep trying to calculate which punches will be thrown next. I have found myself this winter checking the forecast with a sense of both urgency and dismay. Often the hopeful snowflakes predicted three days out become dreaded raindrops by the time we reach them. It seems winter may well pass us by entirely this year. Perhaps it will arrive in April when even the snow-lovers among us are ready for spring. I’m trying to follow my children’s lead, to embrace whatever the weather throws at us, to be flexible in selecting outside activities, to just go with the flow. But I miss the snow, and next winter seems so far away. Original content by Meghan McCarthy McPhaul, posted to her Blog: Writings From a Full Life. This essay also appears as Meghan's Close to Home column in the February 26, 2016 edition of the Littleton Record. The dreaded stomach bug made an uninvited visit to our house this week. It’s moved through the family like a slow-burning forest fire, isolated at first to one person, then hitting the rest of us in quick succession and leaving behind a messy wake of exhaustion and household chaos. My son was the first one down, complaining of a sore tummy as soon as he came out of school Tuesday afternoon. He spent the next four days mostly on the couch, nibbling saltine crackers and sipping Gatorade and ginger ale, occasionally rallying to sit up or walk to the other room or eat a few bites of a sandwich. By Saturday the boy was showing signs of recovery, and everyone else felt mostly fine. I thought perhaps we’d foiled the bug, contained it somehow, miraculously, to one person. From past experience of shared ear infections and colds and conjunctivitis and the flu, I knew this was unlikely, but still I held on to hope. Alas, kid number two woke up sick late that night. Kid number three followed early Sunday morning. As Mom, I am not supposed to get sick, and I did my best for days to ignore a creeping sense of malaise, absconding Saturday and Sunday to the mountain and my weekend job and leaving my husband to manage the sick bay. I had hoped the healing tonic of fresh air would save me. But Monday morning even I was waylaid by the bug, and I took to the couch with my two sick girls. I am not much of a couch-sitter and strongly dislike the feeling of being stuck, which is what happens when you are sick. Being home with sick kids, and being sick myself, is always a lesson in patience. In the past week I have had to let go of some things and rearrange many others. Appointments have been missed and rebooked. Work and laundry and the dishes have piled up. Exercise, even a walk through the woods, seems like a memory from the distant past. We have all spent more time than we’d like lying around, too sick and tired to do much. On my worst day, I finished a book I’d started a couple days earlier, took a nap, read two substantial magazines cover to cover, and then wondered what else I could do from my prone position on the couch. The outside world sort of fades away during sickness, as you try to survive the next wave of nausea, tend to the child crying in the night, focus only on what needs to happen in the immediate future. When the children were up for it, I read to them, whole stories, several in a row. We played rounds of hangman. They watched T.V. while I tried to work in half-hour bursts, interrupted regularly by requests for a drink or a blanket or a complaint of a sore tummy. When you’re sick, you feel like you’ll never feel normal again. Hunger pangs and belly aches gradually mingle so that you can’t tell one from the other and don’t know whether eating will make things better or worse. Things so simple when you’re healthy – cooking dinner, walking up the stairs, running to the post office – become arduous tasks. I have realized with this sickness, and others before this one, how much I take for granted being healthy most of the time. The hindrance of illness is humbling. But just as past experience revealed that if one kid was sick, the other two likely would be before long, it also says this sickness, too, will pass. Eventually. Hopefully soon. Original content by Meghan McCarthy McPhaul, posted to her Blog: Writings From a Full Life. This essay also appears as Meghan's Close to Home column in the February 12, 2016 edition of the Littleton Record.